Watch video demo. mark your reps on board. "Here I am in the wilderness of the Wind River Mountains in Wyoming. We hiked 12+ miles per day, I had a 30 pound pack and it was easy due to my CrossFit Training." Zarco outside at BU CrossFit. Jerry Hill 7:41 at 205lbs, Meg Carlson-Hixson 9:40 at 105lbs. "A Long Summer for 'Weary Tiger' Mothers" by Samantha Bee, The Wall Street Journal. Luan Nguyen and Jordan Erwin. "The difference between school and life? In school, you're taught a lesson and then given a test. In life, you're given a test that teaches you a lesson." Jenn Jones 6:27 (135lb DL), Kim Malz 6:53 (135lb DL), James Hobart 9:14. "CrossFit: Where Navy SEALs and Pregnant Soccer Moms Help Each Other Get Ripped" by Gregory Ferenstein, Fast Company. Jesse Bazarnick 9:32, Austin Malleolo 9:52, Denise Thomas 10:50 (20" box, 1 pood KB), Spencer Hendel 11:46, James Hobart 12:00. "I'm on a road trip on the West Coast. Going to visit as many Crossfit Gyms as possible to gather all the info I can get and try to implement things back in Belgium." "Practicing my 10 ft. wall balls, but without the wall...or the ball!" - Glenn Braunstein, Rosemary Beach, Florida. Rebecca Voigt 3:33 (95lbs), Kristan Clever 7:41 (135lbs). 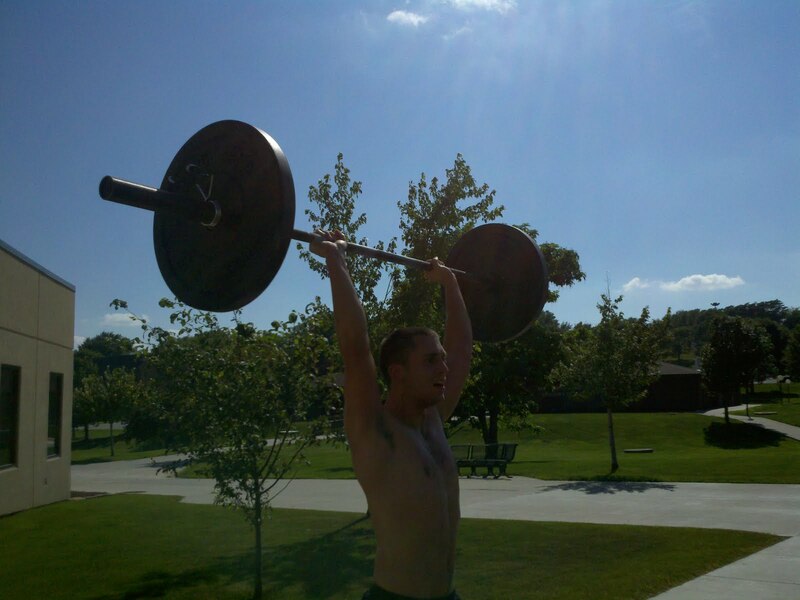 Laurie Galassi 32 (15 HSPU + 17 Pull-up), Jesse Bazarnick 31 (12 HSPU + 19 Pull-up). CrossFit Level 1 Certificate Courses: CrossFit Milford, Rainier CrossFit, CrossFit Charlotte, CrossFit BGI, CrossFit Canarias. "A small number of individuals and myself have been lauding the results of CrossFit in our squadron for the last couple years. 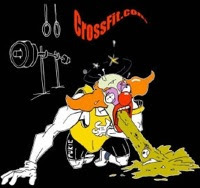 Now they have to know that this programming works after I took first place in the annual Incirlik AB Strongman Competition on July 4th, 2011 with absolutely no strongman training!" Farmers Carry (Run 200m (Out to the fire hydrant and back) carrying 2 16k kettle bells). "Here is a photo from an advanced handstand class we held recently. Setting the rings low enough so that the athlete's hands can create friction against the mat increases support stability. By making one component less difficult you can focus on other aspects of the skill, like midline control." "I've been doing CrossFit since 2008 and it's changed my life. I was always an athlete, but the level you push yourself during CrossFit training is unparalleled to anything I've done before. Thanks for everything, you guys rock!" "Every man is free to rise as far as he's able or willing, but the degree to which he thinks determines the degree to which he'll rise"
Patrick Barber 11:12, Samantha Briggs 13:06. "Today I did a human flag! One year ago I was 246 pounds, overweight and out of shape. Since then I've lost 54 pounds and I am in the best shape I've ever been. CrossFit has changed my life. Thanks Coach Glassman!" Rich Froning 143 reps (23 burpees), Samantha Briggs 121 reps (1 burpee). Eddie Clark, Felice Terrigno and Brian Ivany, Waimea Bay, Hawaii. "Larger Brains May Have Evolved Due to Sports, Not Smarts" by Brian Mossop, Wired. Jenny LaBaw and Annie Thorisdottir. Josh Bridges 7:14, Michelle Kinney 8:36. Post time to comments. Jason Khalipa, 2011 Reebok CrossFit Games Event 5. 2011 Reebok CrossFit Games Finals Premier Show, Live Sunday, July 31th, 1:00pm PDT. "A Brief Oral History of Melissa McCarthy's Huge Bridesmaids Performance" by Nathaniel Penn, GQ.